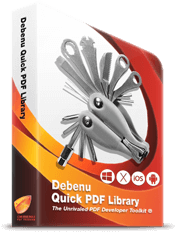 Quick PDF Library is a powerful developer-focused toolkit for adding PDF functionality to your applications. It lets you create, render, print, secure, merge, split and manipulate PDF files with only a few lines of code. Support is provided for the most popular programming languages through ActiveX, DLL, LIB, Delphi, iOS Static Lib and Mac Dylib editions of the library. Download button for the Windows version will be shown after you fill out the form below. Try the free 30 day trial now. Windows XP, Vista, 7, and 8. 32-bit and 64-bit versions.